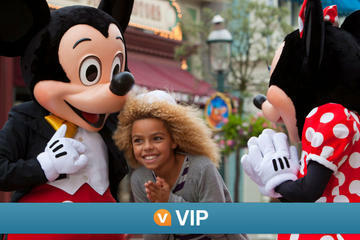 Combine Mickey Mouse magic with superstar treatment on this full-day VIP Disneyland® Paris experience  an exclusive Viator excursion that cant be booked anywhere else! Make use of a 1-day/2 Parks Hopper Ticket which gives you access to Disneyland® Park and Walt Disney Studios® Park, and enjoy skip-the-line access to selected rides with a PREMIUM FASTPASS®. After a day of spin-tastic roller coasters, fun family rides and favorite Disney characters, wind down with a cocktail at Cafe Fantastia and a lavish meal at Disneyland® Hotels California Grill. The grand finale is a glass of Champagne while watching the 'Disney Dreams Show®!' in a premium viewing area; its a VIP treat for the whole family. Special Offer - Save 10% on the recommended retail price for travel on Monday Tuesday or Wednesday until August 31, 2013. BOOK NOW! - Book Now! Head inside Disneyland® Hotel to meet your host and receive your 1-day/2 Parks Hopper Ticket  giving you access to both Disneyland Park and Walt Disney Studios Park. A PREMIUM FASTPASS ticket is also included, which offers skip-the-line access to selected rides. Unlike a normal FASTPASS ticket, where you must visit rides at allocated times to jump the queues, your PREMIUM FASTPASS allows you to skip the lines straight away. See the Itinerary below for full details. Make your dinner reservation for your preferred time at the hotels California Grill, and then head into the park with your host. After ushering you past the entrance lines and through the main gates, your host will leave you to enjoy your VIP day at Disneyland® Paris independently. Head inside Disneyland Park and explore the five different lands into which its split, choosing from a selection of exhilarating big-drop roller coasters and kid-friendly adventures. If thrill-seeking is your thing, check out Space Mountain: Mission 2 in Discovery Land and feel the g-force while riding into the unknown, dodging meteorites and black holes. Treat your kids to a spin on the Mad Hatters Tea Cups in Fantasyland, and sing along with your littlest Disney fans to the theme tune on the 'its a small world' ride. Walt Disney Studios Park is where all the movie magic happens, so be sure to check it out. Step into an enchanting world of cinema and television, and explore the four different cinema studios  each featuring attractions and captivating shows. Look out for all the Disney characters, and pose for pictures with favorite faces like Buzz Lightyear and Mickey Mouse. Both parks have restaurants and fast-food cafes, serving pretty much everything from all-you-can-eat Asian buffets to burgers with fries. After making the most of the Disney magic at both parks, return to Disneyland® Hotel just before dinner and enjoy a cocktail at Cafe Fantasia. Then, make your way to California Grill and take a seat at your table to enjoy your 5-course dinner followed by petits fours and coffee. The acclaimed fine-dining restaurant is known for its high-quality French cuisine, featuring classic haute cuisine dishes. A childrens menu and soft drinks are available for kids aged 3 to 11 years. See the Itinerary for sample menus. After dinner, make your way to the Castle Club Lounge to enjoy a glass of Champagne while watching the spectacular 'Disney Dreams Show®!' from a premium viewing area. Taking place at Disneyland Parks closing time, the sound-and-light show is sure to be your days epic finale, with roughly 20 minutes of dazzling fireworks, illuminated columns of light and state-of-the-art projections. Take your souvenir soft toy of Duffy the Disney Bear (one per child), and then leave Disneyland® Hotel after the show finishes.